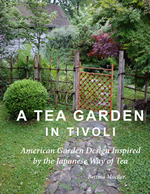 My most recent book is called A Tea Garden in Tivoli – American Garden Design Inspired by the Japanese Way of Tea. Here are a couple of books that I wrote awhile ago. Both are cookbooks and available on Amazon.